If you select any of the government’s welfare cuts since 2010, it’s more than likely that there’s been a bishop or two who have opposed them. Remember the Bishops’ amendment in the House of Lords to scupper plans to cap benefits a family can receive to £26,000? Or the letter signed by 43 bishops criticising the government Bill limiting benefits increases to one per cent per year? There have been broader attacks, too, with another letter from 39 bishops describing cutbacks to and failures in the benefit system as a “national crisis”. Cardinal Vincent Nichols has also described the consequences of welfare changes as “quite frankly a disgrace”. Such episcopal interventions have become somewhat predictable over the years. It could be argued that someone has to do it if our politicians are not willing to stand up for the lowliest and poorest in society, but those who wear dog collars do tend to have more leftist tendencies when it comes to welfare. Research has found that 44 per cent of Anglican clergy think that the welfare budget is too low and should be increased, compared to 15 per cent of the general population and only 9 per cent of weekly Church of England attenders. Jesus said a good deal about defending the poor and needy and a lot less about attempting to balance the books when your country is running up a huge deficit, which is probably why our bishops focus a lot more on the former rather than the latter. Let’s not forget either that it’s much easier to throw out some strongly worded reprimands from the side lines than to be the ones in the middle of the storm trying to actually steer the boat and hold it together. It’s no wonder that government ministers get exasperated at times when they find themselves being told they are lacking compassion and moral judgement yet again, but conversely rarely receive much in the way of affirmation when they get things right. Government ministers might see the bishops’ interventions as an irritating thorn in their side which attempts to prick their consciences in a way that is neither helpful nor necessary. But when people on their own side start to do the same, chances are that it really is time to pause and pay attention. Daniel Kawczynski, Conservative MP for Shrewsbury and Atcham, has written to Work and Pensions Secretary Iain Duncan Smith stating: “I believe the time has come to review this policy and for you to take on board feedback from constituencies as to what is going well and what needs to potentially be reviewed and amended.” He gives the example of the impact on single fathers who lose their visiting rights because they cannot afford a spare room for their children when they visit, as “deeply worrying”. Nigel Mills, MP for Amber Valley, has since publicly voiced his dislike for the penalty, too. Conservative Home reports that the general feeling at the top of the Government – DWP team aside – is that the policy simply isn’t working out sufficiently well to make the political pain a justifiable cost. Isabel Hardman went further last month when she wrote in the Independent that every Conservative minister privately agrees that the bedroom tax was a mistake. Despite this, Conservative Home believes that Iain Duncan Smith, having fought a long battle on the matter, is unlikely to reverse the policy. If this is true, he needs to seriously think again. A YouGov poll last year found that 49 per cent opposed the bedroom tax, but it wouldn’t be surprising to see that the figure has since increased. I personally talked to a large number of people leading up to the election and wasn’t able to find a single person who was in favour of it. Often is was used as the first point to attack the Conservatives, with people intending to vote for another party (even the Lib Dems) solely because of it. Many Conservative voters were not even neutral towards it: they were keen to denounce it and saw it as something of an embarrassment. The policy has failed on so many levels. The DWP has said that it is raising £1 million a day, but in the first year after it was introduced the government made £345m available to councils to help “the most vulnerable people” deal with its introduction. Rent arrears and evictions have soared significantly, denting the expected welfare savings to the point that they are negligible. There is also a shortage of around 100,000 suitable smaller properties in England alone, meaning most people are unable to move even if they want to. The bedroom tax has been a manifest failure in reducing the welfare bill, but worse is the human cost: along with single fathers, it is children, carers and the disabled who have been hammered. It is estimated that two-thirds of those affected are disabled. Personal debt is growing, as is food and fuel poverty as a result. The bedroom tax has the potential to be held up as this and the last government’s poll tax. It may not have caused riots yet, but it is hated and despised in a similar way, and has become an unwelcome stain on our society. The Times reported this week that the late Lord Gould, New Labour’s renowned strategist, had warned members of Ed Miliband’s team early on during his leadership that they had defended the previous Labour government on the wrong points, including on the economy. Yet right up until they lost the General Election, those at the top of Labour refused to admit that their party had overspent whilst in government, despite the evidence to the contrary. Only now, at great cost, are they beginning to acknowledge this serious error of judgment. Politicians find ‘sorry’ the hardest word, and climb-downs or U-turns equally objectionable, even when they are clearly the right thing to do. Iain Duncan Smith had legitimate reasons for introducing the so-called ‘bedroom tax’, but. as most business leaders know, things don’t always go according to plan. and when that is the case it’s time to re-evaluate and make the necessary changes. This is undoubtedly one of those instances. Any gains have been far outweighed by the losses. Far too many people have suffered for far too little return. It might not be Iain Duncan Smith’s political instinct to drop this policy, but any temporary humiliation would soon be overcome by a positive response from the public. It would prove that the Conservatives are not just ‘the party for the rich’ and only interested in number-crunching and those who can afford a life without any state support. It would show that political decisions are subject to ongoing ethical scrutiny, and that Iain Duncan Smith and his party have a heart, such that when they talk about being “all in this together”, it actually means something. On this policy, at least, it doesn’t take much to see that Bishop David has got it right. As a fellow Christian, Iain Duncan Smith would do well to listen, reflect and take on board the episcopal rebuke, along with the criticism of his parliamentary colleagues. 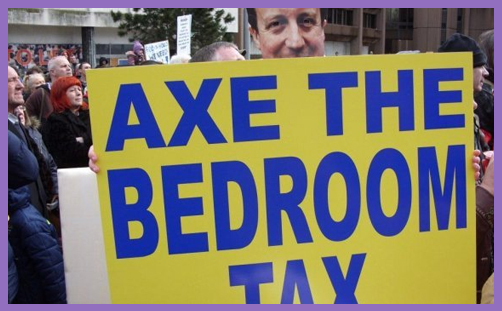 It is time to put the bedroom tax to bed, and wake up to a new morning.